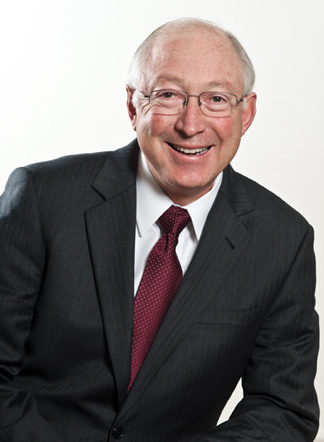 Ken Salazar was confirmed as the 50th Secretary of the U.S. Department of the Interior on January 20, 2009. One of two Hispanics serving in President Obama’s Cabinet, he’s responsible for the National Park Service, the Bureau of Land Management, the United States Fish and Wildlife Service, and the Bureau of Indian Affairs, among others. Prior to his confirmation, he served as Colorado’s Attorney General and was elected to the U.S. Senate in 2004 where he was a leader in creating a vision for a renewable-energy economy that is less dependent on foreign oil. But Salazar is as proud of his heritage as his career in public service. After settling in New Mexico four centuries ago, his family planted roots in Colorado’s San Luis Valley, where they have worked the same land for five generations. Raised on a remote ranch without electricity or telephone, he and his seven brothers and sisters all became first generation college graduates. A rancher for more than thirty years, Salazar has also owned and operated several small businesses, including a Dairy Queen and radio stations in Pueblo and Denver. He recently sat down with LATINO Magazine for a one-on-one interview to talk about some of the key programs he oversees and his plans for the future. What do you consider to be some of your major accomplishments and achievements here at the Department of the Interior? I think they fall within three areas where we have made historic progress on behalf of the nation. The first is energy. We are creating a virtual energy revolution with solar, wind and geothermal energy. By the end of this year we will have [given permits for] 10,000 megawatts, which is the same amount of power from about 30 coal-fired power plants. When we came, it was at a standstill, nothing had been done, and we’ve been able to accomplish that in the last three years. We’ve brought some projects across the finish line, and they include the largest solar commercial-scale power plants in the world, and for the first time a process for permitting offshore wind [farms] on the Atlantic, which have the huge potential to power the energy needs of the Atlantic seaboard. And then on the conventional energy side, we are producing oil and gas in America’s oceans as well as onshore. As the president recently stated, we have done it in a way that’s responsible but also in a way that we’re producing more oil and gas than at any recent time in our history. So, energy is huge for us and for the country. It’s been a large part of our work, and it includes some international issues. I’ve worked with Mexican President Calderón and Secretary of State Clinton and our counterparts in Mexico on an agreement which we signed in Cabo San Lucas recently that will help us move forward with the development of oil and gas both in Mexico as well as here in the United States. Energy is key to us and I am very proud of our achievements. Secondly and just as important, I would say, is our conservation agenda. As Secretary of the Interior, I am the custodian of America’s natural resources, but I’m also the custodian of America’s history. As custodian of America’s natural resources we have envisioned and developed for the president the America’s Great Outdoors initiative. The president and our administration, my department and other departments have been involved. I have led conservation efforts in the Everglades in Florida, the Dakota grasslands in the Dakotas, and hundreds of other places around the country. I’m very proud of the conservation agenda as it relates to our natural resources. On the historical side, we’ve moved forward on the recognition of African American contributions to our country in the creation of the newest of our national parks. That’s at Fort Monroe, which celebrates the end of slavery and is known as a place where slavery began and ended in North America. ... It’s in that vein that our work on Japanese internment camps and Latino heritage have also been important ... in the sense that it has to be an inclusive history of all of America. The third priority is our new beginning with the nation’s first Americans. I have the responsibility on behalf of the United States to have the trust relationship with them. Without being too boastful about it, I will say that I think in three years we have done more than had been done in the previous 300 years. And it includes very specific things, such as moving forward with a water project for the Navajo nation, the restoration of tribal homelands in various places across the country, and creating new economic and educational opportunities. I’ve very proud of the work we’ve done. The president’s leadership and support have allowed us to accomplish so much in so little time. Tell us more about the Latino Heritage Initiative. You’ve created a program to have people become more aware of what the Latino contribution to our history is. For me, it’s been important to have an inclusive America and by that I mean inclusive of all people: women, African Americans, and Latinos as well. And the truth of the matter is, we have downplayed the contributions that many groups have made to the formation of this country. So the Latino Heritage Initiative started when I was in this office a few years ago and someone asked what are we doing to celebrate Latino heritage, and I was given a book that was put together by the National Park Service that talked about Hispanic culture and contributions. I took it home and read it overnight and it seemed like our history stopped in 1835. There was no mention in the book about the Treaty of Guadalupe Hidalgo in 1848, or the founding of the GI Forum in 1948 because of discrimination that existed against our returning Latino heroes. They were being denied burial in our national cemeteries in south Texas. Those are important stories to be told---the history of immigration and the ebbs and flows back and forth across the border, and the service of our forefathers in the wars of our country. That history is not well-known in America, and it’s not known in the schools of our country. Certainly it has not been very well told within the Department of the Interior and by the National Park Service, and so we’re trying to correct the omissions of the past. In doing that, we have started the Latino Heritage Initiative with the National Park Service, and their priority is to make the national parks relevant to everyone, including our nation’s 54 million Latinos. In order to do that, it has to reflect the story of their history. This initiative includes a study that is looking at 16 different areas of Latino contributions in the history of this country. We will have the papers from the historians done in the next several months that will create the blueprint for how the National Park Service incorporates the national Latino story into the story of America. We also have worked with the National Parks Foundation, which I chair by virtue of my position, to establish a National Latino Heritage Fund, and that fund will help us in terms of the implementation of the study. What are some of the things you are doing to get Latinos to get out and enjoy the parks more, to take advantage of what our outdoors have to offer? One of our efforts has been to connect young people to America’s Great Outdoors. Our populations have become much more urbanized in 2012 than we were in 1912. Many of our projects are in the inner cities, in big cities like Los Angeles where Mayor Villaraigosa and I have been working very hard on the restoration of the Los Angeles River and the San Gabriel Mountains where we have a huge number of young people from East L.A. who are working there. We’re trying to make sure that as we implement America’s Great Outdoors program that it’s reaching all of America for a lot of reasons, including that it’s healthy for young people to be in the outdoors. The second thing I would say is within our department, I have prioritized the hiring of young people as part of a program I created when I came over here, and we have had on average approximately 20,000 young people who get paid jobs working for us here at Interior, helping the biologists, the water monitoring programs, helping in the national parks. A very significant percentage of them are from the African American and Latino communities. Do you have any plans to help the President during the reelection campaign and to get the word out to Latino voters? At this point I have no specific plans for that. My job, first and foremost, is to do a good job as Secretary of the Interior because I think that reflects well on the president of the United States. Secondly, within the limitations that we have, the number of restrictions that we have to operate in, I will do everything within my power to make sure that everybody knows the values that Barack Obama as president has and how he has put those values into action. He and I have known each other for a long time and he shares my values, I share his. He is working very hard on behalf of all Americans, and working very hard to make sure that we have an inclusive America. There have been gatherings of Latino appointees and it is a very strong group. Just years ago you would have a token Latino here, a token Latino there, but not now. And it’s because of the direction from the White House. This is about an inclusive America. Have you thought beyond this term now to the second term? Any plans?